Everything about the early 007 movies are famous–the gagdets, the girls, the theme song, the locales, that first utterance of “Bond. James Bond.” Sean Connery became the Bond that everyone following him would futilely be unable to surpass in many people’s minds. 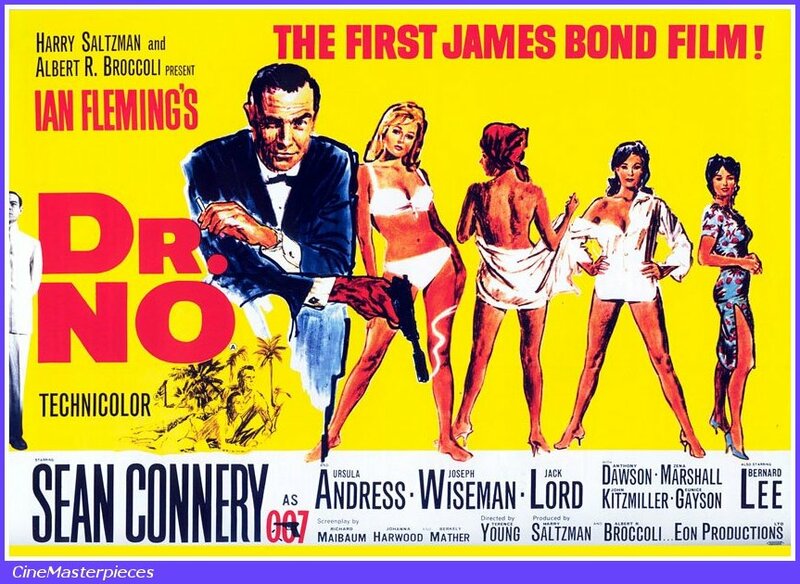 What’s amazing about watching the first Bond film, Dr. No, is how simple it all was back then. When you look at the more recent Bonds, it became all about action and throwaway style, the character of Bond so deeply ingrained in the fans of 007 that the new movies rarely pause to breathe. A charming aspect of the early films is “Bond at work,” at Her Majesty’s Secret Service, getting his missions from his boss M (Bernard Lee) and playful flirting with Moneypenny (Lois Maxwell). On the job, he takes careful consideration of his hotel rooms, looking for bugs and boobytrapping his closets and briefcases. The style of Bond is subtle, rather than the walking advertisement of today. The films, now spanning into their fifth decade, are testaments the evolution (or devolution, depending on your view) of the movie industry. In Dr. No, Bond (Connery) is sent to Jamaica to find out what happened to an agent there. Also, the U.S. has been worried about what has been causing the disruptions with their rocket launches, so Bond teams with the CIA agent Felix Leiter (Jack Lord) and a Jamaican, Quarrel (John Kitzmiller) to see if there is a link between the two incidents. A Professor Dent (Anthony Dawson) is the link, which leads Bond to a forbidden island headed by Dr. No (Joseph Wiseman), who like many Bond villains is megalomaniacal, and thinks he’s a genius and thinks everyone else is stupid. He is part of the criminal organization SPECTRE, which becomes more integral in later installments. It’s on this island that Bond has the famous encounter with Honey Ryder (Ursula Andress), who walks in from the water to the beach in a white two-piece holding a seashell in each hand. It gives birth to the first couple of Bond double entendres. Dr. No certainly seems antiquated now, with the interiors looking way too much like sets rather than actual places, and the fights are stagy, punches are pulled. But I can’t look at a movie from the sixties and think, “They should have done better,” because it was a completely different time. I look at a movie like Dr. No and think “classic.” The story is simple but intriguing, and Connery drives the whole movie. The film wouldn’t work without his completely assured performance. And, as the interviews and documentaries attest, director Terence Young was Bond. His own personal sense of style went into every frame of the movie, including Connery’s archetypal performance. So, despite the era’s limitations, the movie is an enjoyable action film. After the amazing “Goldfinger,” this has always been my second favorite Bond movie, although some days I’ll say “The Spy Who Loved Me,” the only Roger Moore film that was worth a damn. I’m looking forward to reading the rest of these. Me too. This Bond-review section as we count down to the new Bond film is a smashing idea! Glad you guys find this to be a corking idea. I think I’m going to be dreaming Bond for the next few weeks.